To celebrate National Chili Day on February 4th, American Institute’s West Hartford campus organized a Chili Cookoff. 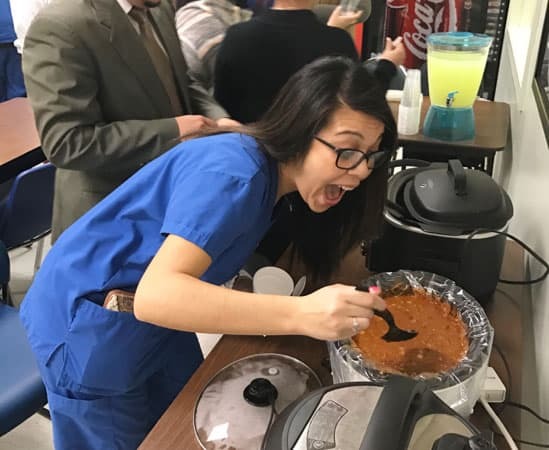 Staff members brought in examples of their favorite chili recipes and competed for the title of Champion Chili Chef. About 25 students and a number of staff members sampled the different offerings and voted on their favorite. In the end, Apryl Campbell, Dental Assisting Program Director, won with 11 votes. “Most of our events are education based, so we like to organize events just for fun once in a while,” said Ms Colbert. “It’s nice to take a break from the rigors of academic life and enjoy a meal together with students, instructors and staff.